Making keyboards is an art and Korg has been a pioneer in doing it. Their Korg Kronos X 88-key Music Workstation is boosted with internal memory and SSD size to give you an even greater control over music creation. This has made Kronos a complete game changer keyboard workstation. Kronos has been a path breaking innovation from Korg, which has got the attention of every music lover ever since its debut in the winter of 2011. It’s equipped with amazing functions that enable you to be as creative as you can possibly be. Kronos X is equipped with nine independent synthesis engines which virtually gives out any sound you can think of. Be it acoustic instruments or gritty analog synths, the nine synthesis engines on board of Korg’s Kronos X can give out every needed sound. It also has a SGX 1 acoustic piano engine which can lend its users all the nuances of grand pianos from Japan and Germany. Its EP 1 engine of electric piano gives out multiple dimensions which lets morph, tweak and completely customize all the wide range of vintage sounds of electric piano. Along with all the wonderful engines, Kronos also has all the amazing technologies make sounds smoother and more expressive. Korg has equipped this workstation with a solid flash based storage capacity. It also has super fast streaming because of its solid state memory. This is a big advantage of Korg’s Virtua Memory Technology that will give you very high polyphonic and wonderful unlooped samples. Creating program is one area that most of the musicians like and Kronos X has a complete 32 track music creation workstation, along with a 16 track sequencer. Korg has also given Kronos X the ability to record as many as 16 tracks, all of which in 24 bit/ 48 khz quality. 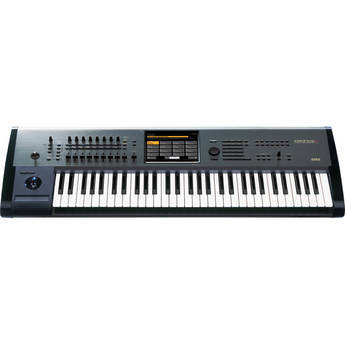 Korg Kronos X 88-key Music Workstation also gives out a complete rack full of effects which takes your music to a complete different level. You can use up to 16 different effects at once, each of which are much more than its rivals give out. It also has a very useful Sampling System. Thanks to this feature you can easily sample and re-sample any sound you create. The overall environment is also very easy to use with a high definition 8 inches touch screen that will help with navigation through the entire Kornos X environment. It also has a dedicated control surface along with channel strip styled slider, buttons and knobs. Perfection is something many brands strive for, but it’s pretty hard to attain. Sometimes switching off sounds from one sound patch to another can be a bit difficult. Tough such occurrences are not frequently observed, there are some reviewers who have mentioned this. Also something else that some have mentioned is that it started to automatically reboot itself. As soon as it started to load, it got stuck and had to be manually rebooted. These cases are exceptions to the rule, but if you experience any issues with your product after first trial, most online retailers have return policies. 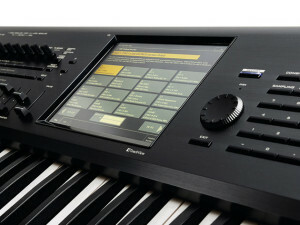 The Korg Kronos X 88-key Music Workstation has attained a high reputation ever since its launch. It’s an incredible musical instrument which is specially designed to deliver fantastic sounds and provide you with endless sound creating possibilities.